An elderly man suffered serious injuries and was airlifted to hospital after being hit by a lorry on the M40 near Gaydon today (Monday, July 31). 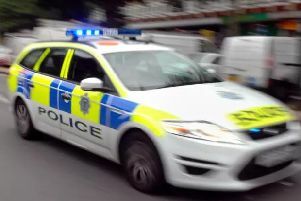 Police and ambulance crews were called at around 12.50pm after reports of an accident on the southbound carriageway a quarter of a mile south of junction 12 for Gaydon . Paramedics stabilised the man’s condition before being anaesthetised and taken to University Hospital Coventry and Warwickshire by Warwickshire and Northamptonshire Air Ambulance. The M40 was shut between Gaydon and J11 for Banbury. Initially just the southbound carriageway was shut but the northbound side has been closed too to allow the air ambulance to land. The southbound entry slip road at J12 was also closed. But the northbound side has reopened and one lane is still closed southbound. There are long delays for motorists, who are advised to avoid the area, and a diversion has been set up.